This edited article about America originally appeared in Look and Learn issue number 413 published on 13 December 1969. Capt. Brant (the Mohawk Chief) dined here. He has a countenance expressive of art or cunning. He wore an English Coat with a handsome Crimson Silk blanket lined with black and trimmed with gold fringe and wore a Fur Cap. Round his neck he had a string of plaited sweet hay. It is a kind of grass which never loses its pleasant scent. The Indians are very fond of it. Its smell is like the Tonquin bean. Mrs. Simcoe was the wife of the first Lieutenant Governor of Upper Canada, now the Province of Ontario. Colonel Simcoe had fought in the American War of Independence and in 1791 returned to North America to govern a province where many Americans who had remained loyal to Britain settled after the war. The Simcoes were in Canada nearly five years and Mrs. Simcoe, who was born in 1766, kept a diary which gives us a wonderful picture of a young, pioneering community. She loved travelling and meeting Indians and sketched many beauty spots, including Niagara Falls. Joseph Brant, the “Capt. Brant” who dined with the Simcoes, had an amazing life. Born in 1742 into the Mohawk tribe of the famous Iroquois Confederacy, he was on the warpath at 13, when the Mohawks supported Britain against France at the Battle of Lake George. After his sister, Molly, married Sir William Johnson, the Superintendent of Indian Affairs, his life was transformed. As well as fighting, he went to an American school for Indians, translated part of the Bible into Mohawk and, by the time the War of Independence started in 1775, was the leader of his people. He visited London in 1776, was painted by George Romney, and decided to support Britain against her Colonists to protect Indian lands already threatened by American settlers. Returning home, he led brilliant guerrilla raids both as an Indian, War Chief and as a British officer, which devastated the fertile Mohawk Valley in New York and resulted in General Washington’s troops nearly starving. He commanded white Loyalists as well as Indians, both driven from their homes by the Rebels, and, in a bitter civil war, did his best to restrain his men from revenging themselves on their ex-neighbours. Brant had arranged for his people to be given land in case Britain lost, which she did! 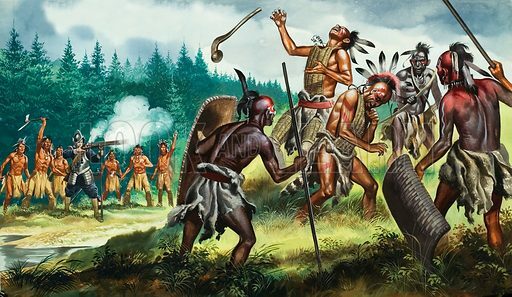 Most Mohawks and many other Iroquois moved to Canada to what is now Brantford, Ontario. Brant paid a second, spectacular visit to London on Indian business and pleased George III by refusing to kiss his hand but kissing the Queen’s instead! He alternated between Indian and white man’s clothes. Brant next tried to form an Indian barrier state to prevent westward-moving white settlers grabbing Indian lands, but he could not keep the many different tribes united. Mrs. Simcoe wrote that he looked cunning: he needed to be! He died in 1807 and a magnificent statue of him was later erected in Brantford. This edited article about motor racing originally appeared in Look and Learn issue number 413 published on 13 December 1969. 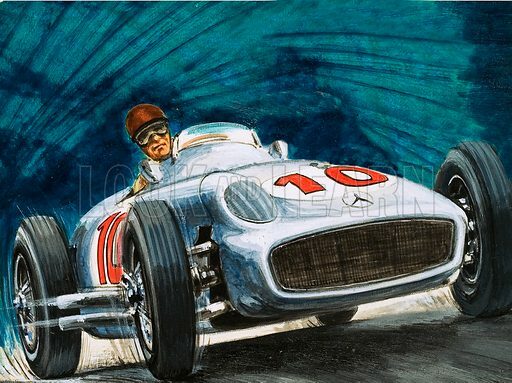 Much in the same way as Mercedes had dominated the Grand Prix scene on the eve of the First World War, so Mercedes Benz, with interruptions from Auto Union, dominated it on the eve of the Second World War. Alfa Romeo, not having been very successful with their Grand Prix design during the ’30s, concentrated on the Formula 2 class and produced a 1 ½ litre supercharged car called, at this time, the Alfette, and later the type 158/159, which became the greatest racing car of all time. In 1938, it won the first race in which it was entered – the Coppa Ciano – (the driver was Villoresi) and just before Italy entered the war it was successful in the Tripoli Grand Prix. In this it was driven by Dr. Farina at an average speed of 128 mph. This was one mile an hour faster than the 3 litre Formula 1 record set up by Herman Lang on a Mercedes in 1938. After the guns had ceased firing in Europe, Grand Prix racing returned very rapidly. The formula which had been 3 litres supercharged in 1939 was now 1 ½ litres supercharged. Thus, the Alfa Romeo Formula 2 champion of 1939-41 now became the Formula 1 car. When Farina won the Grand Prix de Nations in 1946 on the 158 Alfa Romeo, he started an incredible run of 27 consecutive Grand Prix victories. In 1950, he won the first Grand Prix Drivers’ Championship. The following year, Juan Fangio won his first Grand Prix championship driving the type 158. After this, Alfa Romeo retired from Grand Prix motor racing and have never returned. Theirs was the only car ever to win both Formula 1 and Formula 2 championships. This edited article about the United States of America originally appeared in Look and Learn issue number 413 published on 13 December 1969. Missouri’s nickname, the Gateway to the West, was particularly apt in the mid 19th century. The great trails westwards, the Oregon Trail, the California Trail and the Santa Fe Trail all started in the state. From the 1830s to the 1850s, the small town of Independence was one of the most important spots in the world. 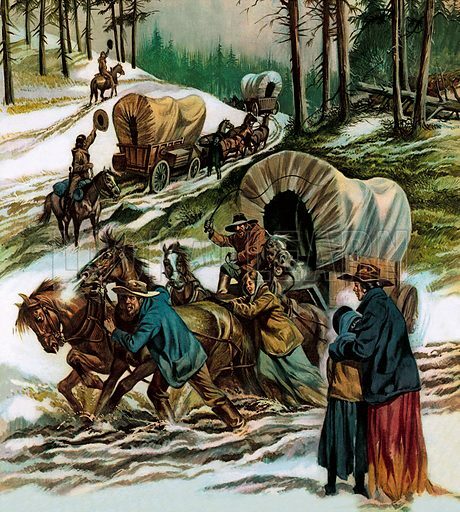 It was the “jumping off place of the American Frontier,” where traders and trappers, rogues and murderers, and thousands of ordinary men, women and children assembled to cross the prairies and mountains, and face scalding heat, freezing cold, Indian attacks, starvation, thirst and exhaustion in search of a new homeland in the West. Oregon was more than 2,000 miles away – and the California Trail branched off the Oregon route. The Santa Fe Trail, used mainly by trappers and traders, went to the South-West. 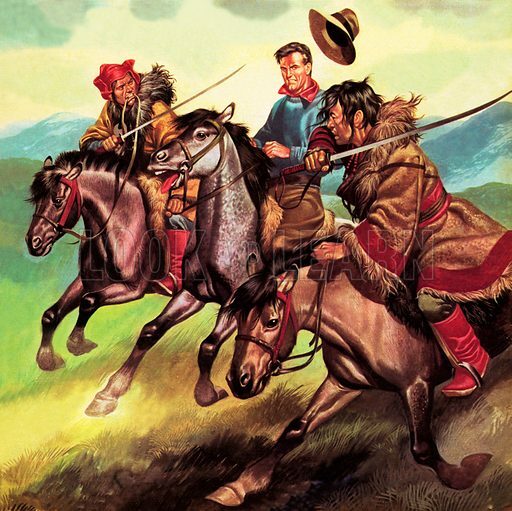 However, the epic journeys across untamed America must have been great levellers. In the face of countless hardships, the unconquerable spirit alone mattered, and the early pioneers showed that they had that in plenty. Their story is one of America’s finest. This edited article about adventure originally appeared in Look and Learn issue number 413 published on 13 December 1969. Petro had not been really worried when the clutch casing of his truck had been smashed on a rock. While the rest of his expedition headed westwards through Sin-Kiang, a remote Chinese province north of Tibet, he remained in the walled city of Hami to wait for a replacement. In a day or two a camel caravan was due, bringing up spares and supplies. Unfortunately, Hami turned out to be anything but peaceful. A civil war had just broken out in the area and the day after the expedition drove away, rebel tribesmen surrounded the city. Hami was besieged. At dawn, two days later, the rebels attacked. They unsportingly used slaves for the most dangerous job – placing ladders against the 28-foot-high walls – then they swarmed up the ladders with swords, while hidden riflemen gave them covering fire. The garrison put up a terrific fight, using everything from rifles to rocks and bales of burning straw, but the outlook seemed grim until a machine gun opened up on the walls and the attackers fled. They did not flee far: the city remained under siege, and the prospects of Petro getting his replacement seemed remote. This edited article about cinema originally appeared in Look and Learn issue number 413 published on 13 December 1969. It is dark and late when the silence of the house is broken by a knocking at the door. The sound reverberates through the old house, and the young couple who are visitors to the place look at each other over the guttering candle that rests on a table, casting dramatic shadows over their tense and drawn faces. The knocking is heard again, more thunderous this time. Slowly, taking his time, the young man goes to the door and begins pulling back the heavy bolts. 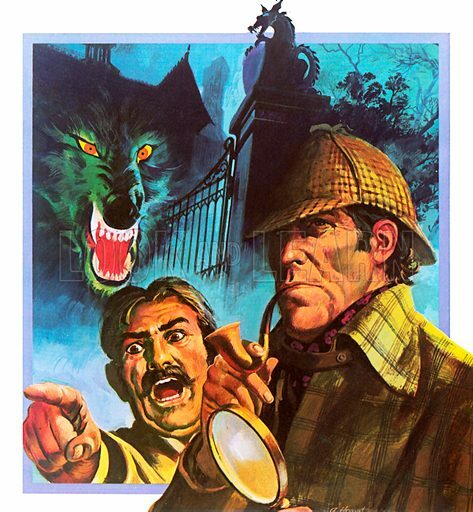 With a great deal of creaking, the door swings open – to reveal the local vicar who, it turns out, is there for some entirely trivial and unconvincing reason. The scene described could have been from any film of suspense made in the early days of the talkies when sinister happenings in old, dark houses were common. Since then, more sophisticated methods have been used to scare audiences. Which leads us to posing the question – why do audiences like to be scared? To answer this, we must first realise that every time we enter a cinema, we live for a few hours a life other than our own. In the darkened auditorium we become a cowboy bent on vengeance, a police inspector on the trail of a murderer, or an explorer, or whatever other character we see on the screen before us. In the same way that we share their thrills, we also share their fears, knowing in the back of our mind anyway, “that it is only a film.” We actually enjoy being frightened – as long as what is frightening us remains on the screen. Even the young filmgoer likes to be frightened, a fact which Walt Disney knew and exploited in his cartoon films, which had more than their full quota of cackling witches and baleful black cats. Suspense takes all forms in the cinema. There is suspense in the classic Western situation, when two cowboys move towards each other for the final showdown in the deserted, silent street of some small, Western town. A Harold Lloyd comedy, with Lloyd teetering among the girders of an unfinished skyscraper, can provide suspense. Generally, however, we associate suspense with the thriller. This edited article about Tudor England originally appeared in Look and Learn issue number 413 published on 13 December 1969. Those words, full of lusty patriotism, from the famous old English song, conjure up a wonderful vision of sturdy men in sunny green fields in a land flowing with milk and honey. The song invites us to think of the yeomen as the backbone of England – bastions of freedom and an impassable barrier against oppression. And that, 400 years ago in the golden age of Tudor England, was exactly what they were. What, in fact, was a yeoman? The term covered a number of classes of well-to-do countrymen. They were tenant farmers or owners of freehold land, or even peasants who were tenants of land with a fixed rent. It might come as a surprise to think of a peasant as a yeoman. 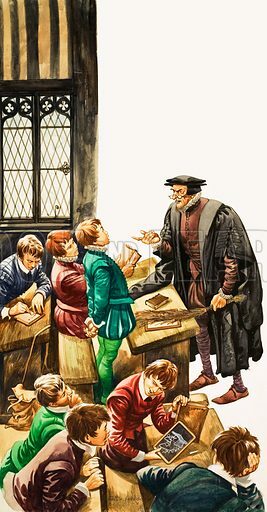 But in Tudor times the word peasant did not have the sometimes impolite meaning we give it today. And in Tudor times, too, there were two distinctly different types of peasant who could be distinguished as simply lucky or unlucky. The lucky ones were yeomen – the unlucky ones were just desperately poor people. The distinction arose because in the first sixty years of the sixteenth century, as a result of the royal habit of debasing the nation’s coinage, food prices in England rose by nearly 200 per cent while wages scarcely rose at all. During this time some peasants held land at a fixed rent which was protected by law, while others held land on which the rent was renewable annually. Landlords, themselves faced with spiralling prices, sought redemption by raising the annual rents to a sky-high level, so that those peasants who by chance had annual leases were made to suffer real hardships. Those whose rents were fixed enjoyed with the freeholders the advantage of being able to sell their produce at three times the price they once fetched while not paying an extra penny in rent. The unfortunates, as ever, swelled the beggar population, to such an extent that an Act was passed licensing only the lame and infirm to beg; “sturdy beggars,” if caught, were shipped for the first offence, were shipped and had part of an ear cut off for the second offence, and hanged for the third. While Tudor times were therefore terribly hard for some, for the majority of the four million people who lived in England and Wales it was truly a fair and prosperous land. We have the proof of this in the writings of many European travellers and the comparisons they made between life here and in the Continental countries. This edited article about music originally appeared in Look and Learn issue number 413 published on 13 December 1969. Felix Mendelssohn’s first name is the Latin word for “happy” or “fortunate,” and no other classical composer had such a pampered and carefree upbringing. Born the son of a rich Hamburg banker, Felix was spoiled to an almost alarming extent. From an early age he displayed a fine gift for music, and by the time he was twelve, in 1821, he and his elder sister, Fanny, had written a short opera. 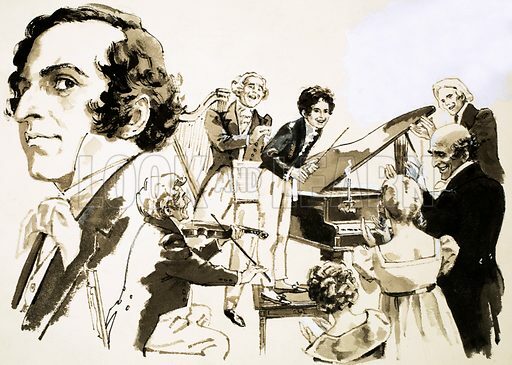 For most children this might have been enough, but Felix wanted to have the opera performed before an audience of critics and professional musicians. His father listened sympathetically to his request, and allowed him to hire several musicians from the Court orchestra in Berlin, where the Mendelssohns were then living. A short time later the opera was “staged” in the banker’s house. The orchestra was conducted by Felix – who stood on a footstool expertly wielding his baton – and at the end of the performance the youngster received a standing ovation. Soon Felix had composed some sixty songs and piano pieces, and his musical career was well under way. But despite his love of luxury he was not blind to the simpler joys of life. A trip to Lake Geneva in 1822 provided the inspiration for two songs and a piano quartet. And four years later he produced his melodious overture to A Midsummer Night’s Dream – most of which he wrote while sunning himself in his family’s large garden. Mendelssohn was now happily married, but in 1846 he was prostrated by the sudden death of his beloved sister, Fanny. He never completely recovered from this blow, and died himself less than six months later at the age of only thirty-seven. This edited article about children’s literature originally appeared in Look and Learn issue number 413 published on 13 December 1969. 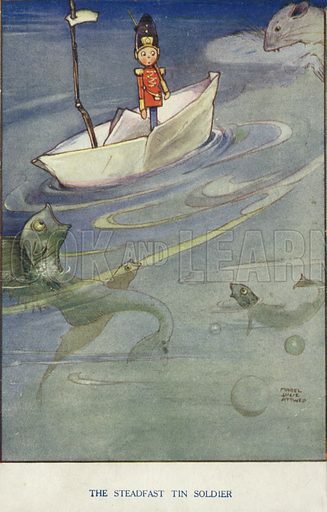 It was on the death of his cobbler father that the citizens of Odense, in Denmark, first commented on the odd behaviour of Hans Christian Andersen. The youngster did no work and spent his days sewing clothes for the puppets which were his proudest possession. Eventually the neighbours told Mrs. Andersen that she must make her unambitious son take a job, and help to support her. So Hans was sent out to work in a cloth mill, and then in a snuff factory. But in both places he fell foul of his fellow apprentices. They jeered at the way he sang out loud for most of the day, and told him he should be an actor on the stage. Hans entirely agreed with them and, in 1819, when he was fourteen years old, he told his mother that he was going to seek his fortune in Copenhagen, the Danish capital. On reaching Copenhagen he scraped a living by giving professional puppet shows. A year later, after working as a stage-hand, the tall thin youngster made his first appearance at the Royal Theatre as a masked troll, or evil giant, in a newly-written ballet. As an actor-dancer, however, he was not an outstanding success. Realising this, he spent much of his time writing plays, novels, and opera librettos. But despite the production of some of his tragedies, and the publication of his first poems, Andersen still did not feel that he had found the right outlet for his undoubted talent. It was not until 1835, after he had established himself as a dramatist, that he wrote the first of his unique and beautiful fairy stories, The Tinder Box. Altogether he wrote four such tales, and regarded them as being mere trifles. He scoffed at a friend who told him that the stories would bring him immortality, and placed his faith in a novel he had just completed. Although his writing career flourished, Andersen was doomed to unhappiness in his private life. He never married, and many of his days were shrouded by moods of black despair. In an unsuccessful attempt to shake off his gloom he travelled throughout Europe, and finally died in Denmark in 1875. But children always associate the magic words “Once upon a time” with Hans Christian Andersen and for them his stories will live on. This edited article about the Royal Navy originally appeared in Look and Learn issue number 413 published on 13 December 1969. It was the beginning of the year, 1797, and it seemed to the people of Britain that there had never been such a bad beginning to a year. After nearly four years of war, Napoleon had forced her to her knees, and now Ireland was on the point of rebellion. Even worse, for those with money at least, there was a run on the Bank of England which could spell ruin for many. Bad times, indeed! One thought sustained the British people in the early months of that year. The Navy, symbol of British power, was intact, and Jolly Jack Tar still manned the fleet, God bless him. It was true that Jack Tar had complained for years of his lot, and it was true that he had some cause for complaint. It was said that his food was unappetising. But on the other hand it was a well-known fact that Jack Tar did not appreciate good food. Was not his most popular dish, burgoo, or Scotch coffee, which consisted mostly of porridge with gobbets of meat floating in it, plus a little vinegar? It was also true that many a man had become a sailor, only because he had been rounded up by a press gang. But was it not also true that many an impressed man had been brought aboard in filthy rags, which clearly showed he was better off aboard ship? 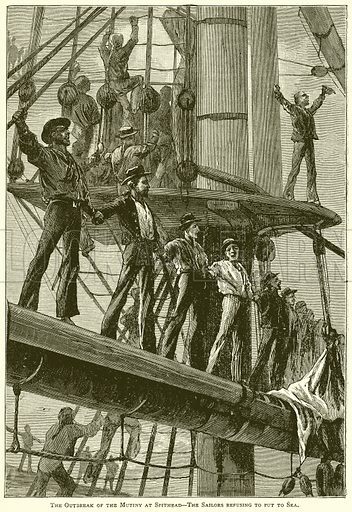 Why, even the most vile paupers and ruffians had been rescued from the sinks of London and had been given the chance of a clean, healthy life on board one of His Majesty’s ships. It was true that men were flogged, but discipline was always necessary, and, anyway, a mere dozen strokes of the lash was the maximum punishment laid down by Naval Regulations. There was talk that, in actual fact, a hundred strokes was a common punishment. But of course these were only stories put around by vicious agitators. So the people of England thought and talked of their sailors, dismissing most of the terrible tales of hardship and suffering as a pack of lies. But all of it, and more, was true. In addition to being half beaten to death for every misdemeanour, the British sailor of those times was forced to sleep cheek by jowl in the most appalling conditions in leaking ships where disease was forever rife. His pay, such as it was, had not changed since the reign of Charles the II, though the price of common necessities had greatly increased. His officers were often sadistic brutes, and nor was there any escape from them, for whenever a ship was in port no leave was granted, because men who went ashore would never return. In the February of 1797, Jolly Jack Tar decided that he had suffered enough. The wonder of it all is that he had not come to this conclusion before. Now that he had come to it, his plan was awe-inspiring – nothing less than the greatest mutiny of English history. This edited article about France originally appeared in Look and Learn issue number 413 published on 13 December 1969. He came to the Prussian doctor’s house wearing a torn brown coat. He had long hair, an untidy beard. His face was black, looking as though it had been burned. His eyes were red and glistening. This fearsome, wild-looking figure stood for a moment, surprised that no one in the room recognised him. 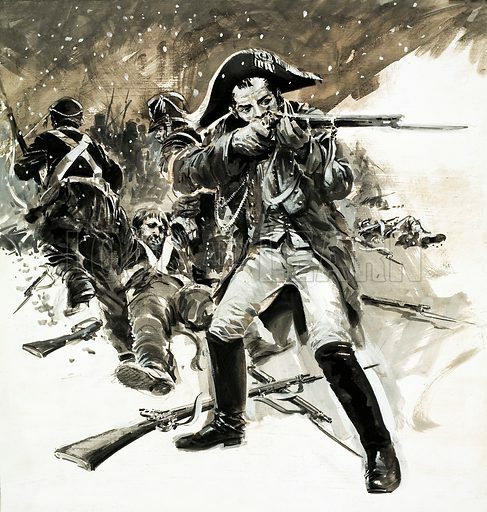 “Who are you?” asked Count Dumas, Intendant-General of the French Army, who had sought rest and refuge in the house. Michel Ney is one of the great heroes of France. His start in life was humble. He was a barrel-maker’s son. He had little schooling and when 19 years old he joined the Hussars as an ordinary trooper. This was before the French Revolution, but three years later, after the great upheaval that swept away the aristocracy and many of the officers of the army, young Michel Ney was elected by his comrades to lead them as a lieutenant. Promotion for Ney was speedy. He was a good soldier, popular with his men, and courageous in the face of the enemy. Time and time again he was the man who led the first charge, struck the first blow with his gleaming sabre. With every battle in which he took part came honour and glory. Hardly a year passed without him earning higher promotion, until at the early age of 30 he was a general in charge of a brigade. With Napoleon’s rise to power, Michel Ney was one of the first to become wholly dedicated to the cause of this outstanding empire-builder. It was he who begged Napoleon to declare himself Emperor of the French, and as a reward for his valiant services was himself created a Marshal of France.